I am attempting to edit a pdf document on my Win 7 computer using Acrobat 9 Standard. I want to change an image/picture. However, on the tools tab/advanced editing tabs there is no selection to choose edit an image. How can I remove an old picture/image in the pdf and insert a new image? I don't have Acrobat 9 installed any longer. It didn't work now I'm attempting to convert the entire MS Word Document to a pdf file format. Thanks for helping out. which is it???? first you say you are editing a pdf doc and now you say you are trying to convert a ms word doc????? 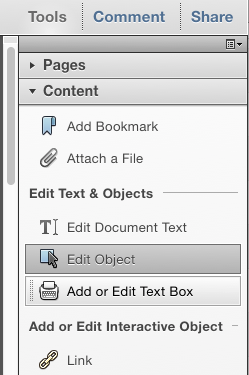 If it's a MS Word document just open it in Word and then under File click Save As, and then scroll down to PDF. I think that Windrider gave up editing pdf in Acrobat and just created a new pdf in Word.